Vaping has taken off with young people and one e-cigarette brand is especially popular, Juul. 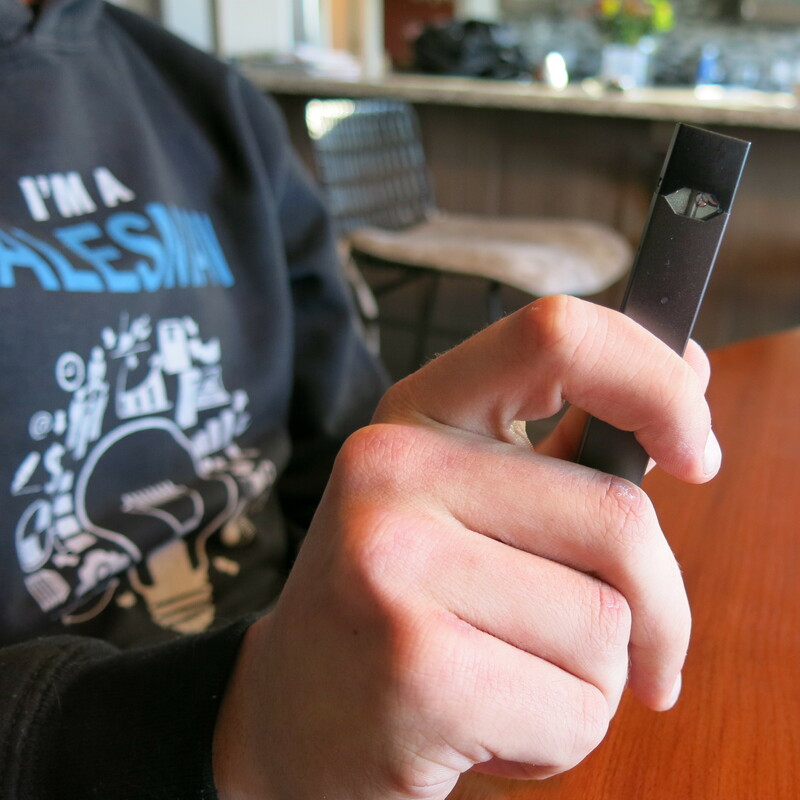 Not all e-cigarette products contain nicotine, but many do, including Juul. And some people fear a new generation is on its way to getting hooked. From Colorado Public Radio, John Daley explains. 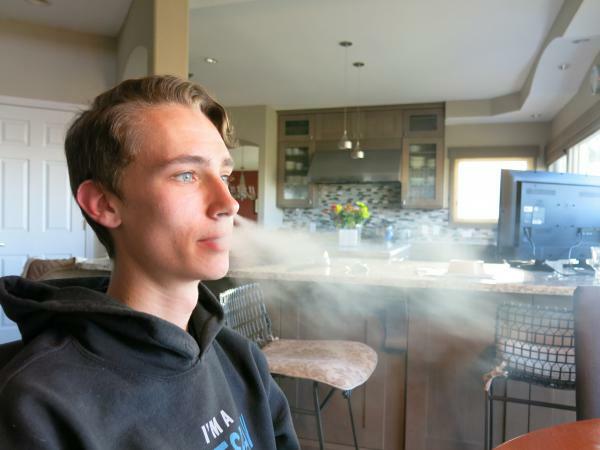 JOHN DALEY: When someone vapes, be it a Juul or another brand, there's no fire, ash or smoky odor. Public health officials worry it could be an emerging disaster. Twenty-one-year-old Julien Lavandier says, believe it. JULIEN LAVANDIER: It's a habit for me all the time. When I set down my schoolwork to do homework, take a rip of the Juul - when I get in my car, take a rip of the Juul. DALEY: Lavandier, a college student at CSU, says he started vaping when he was 16, a sophomore in high school. It was common to smoke an e-cigarette at parties. When vaping, you inhale water vapor through a device, an e-cigarette or other battery-powered inhaler, that heats up and vaporizes a liquid or solid. LAVANDIER: At first, it was a lot of chasing flavors or doing smoke tricks, and that was really what impressed me. I thought, you know, this is cool. This looks like something fun. DALEY: He says students at his high school smoked in class without teachers knowing. Lavandier started vaping regularly and later began smoking traditional cigarettes. When Juul arrived on the market, he took up that brand. LAVANDIER: It's impossible to let go once you've started using it. I'll tell you after even an hour and a half or two, I am chomping at the bit to find my Juul. LAVANDIER: Stores aren't supposed to sell e-cigarettes to minors, but Lavandier has been buying them for years and never been carded, not once, he says. 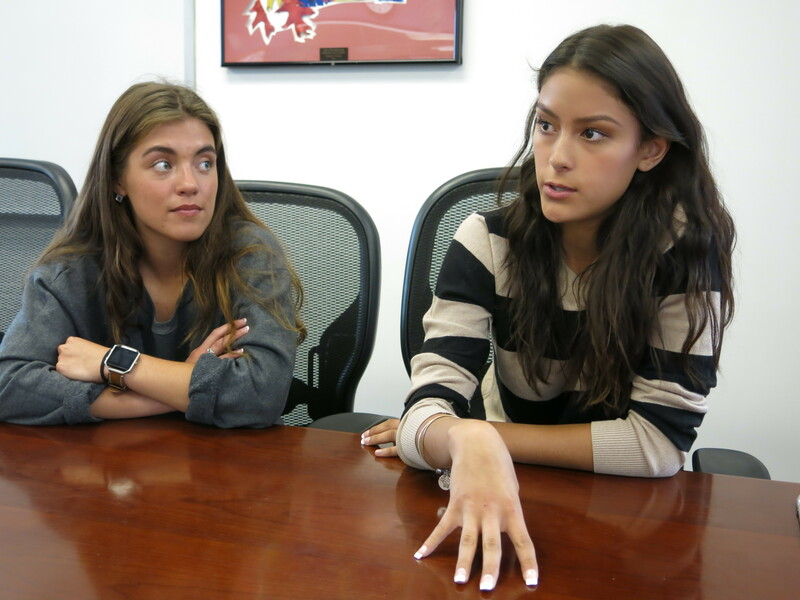 Representatives from Juul Labs in a statement say its products offer a true alternative to adult smokers, not anyone else, not minors. Other companies that make e-liquids also say their products are not for minors, but Juul and other brands offer flavors like cotton candy, caramel and cookies and milk. JAMESON RODGERS: If they taste good and a kid might get their hands on, that's not our goal. DALEY: That's Jameson Rodgers. He's with California-based NEwhere Inc, a producer of e-cigarette and vaping products. He says its products comply with federal law, and it's up to retailers and distributors to not sell to minors. RODGERS: Some of the responsibility has to fall on the parents of any kid that's deciding to walk into an adult store whether, that's a liquor store, or tobacco store, or whatnot. DALEY: One of the benefits of e-cigarettes, according to the industry, is that they can help people quit traditional smoking. Ray Story is CEO of the Tobacco Vapor Electronic Cigarette Association. RAY STORY: Don't start at all. But if you are going to smoke or do e-cigarettes, then certainly take an e-cigarette because it's vastly less harmful than conventional tobacco. DEBORAH LIPTZIN: This is a new way to get kids addicted to nicotine. 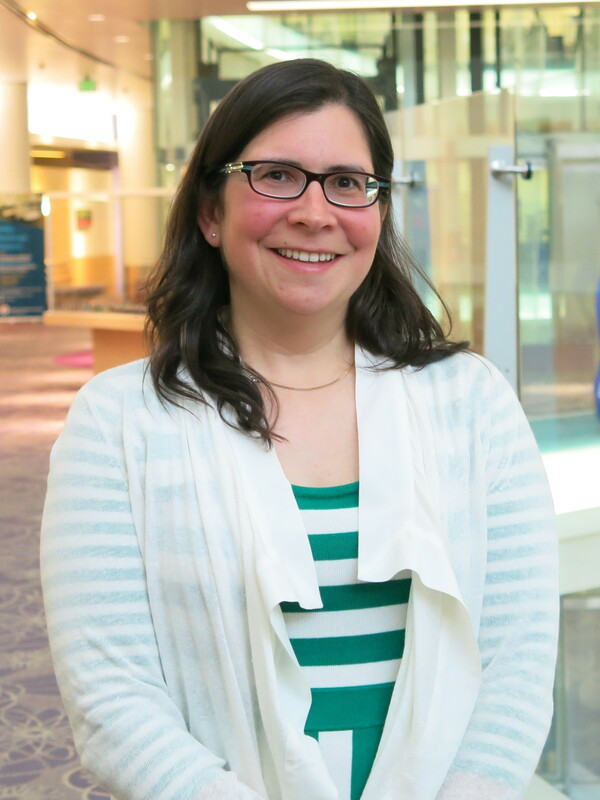 DALEY: Deb Liptzin is a pediatric pulmonologist at Children's Hospital Colorado. She says there's been scant e-cigarette research. LIPTZIN: They specifically used nicotine salts. We have no research that I could find on nicotine salts that are inhaled because it's so new. DALEY: Data in Colorado shows e-cigarettes are far more popular than traditional cigarettes with high schoolers. 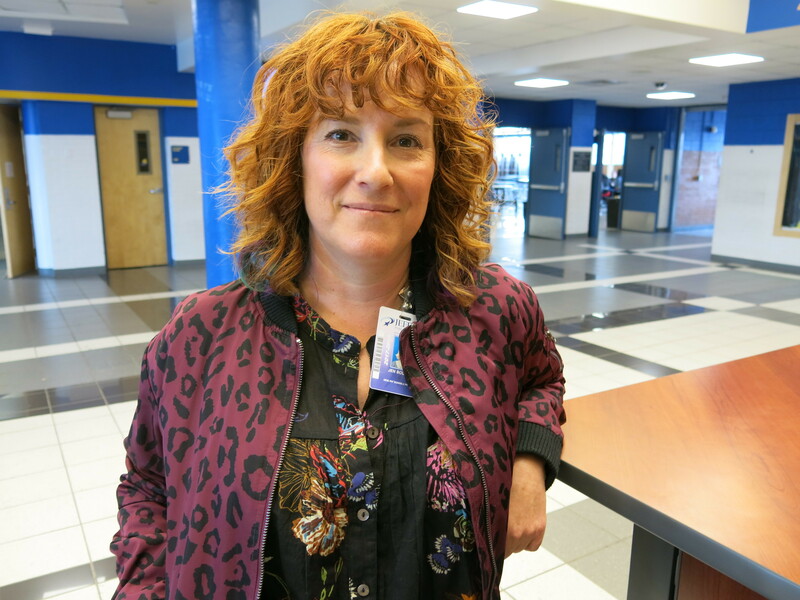 Jen Bolcoa is a health educator with Jefferson County schools. JEN BOLCOA: The Juul has definitely been a game changer. BOLCOA: Don't realize how much nicotine is in there or that there is even any nicotine. DALEY: Bolcoa works to educate students on the dangers, and it's a tough task. On YouTube, there's a slew of videos like one called "Juul Challenge." Two guys sit in the smoke-filled front seat of a car competing, pulling on Juuls. UNIDENTIFIED PERSON #1: Cheers, guys. Let's see how many hits I can do. You got five? UNIDENTIFIED PERSON #1: How many hits can you do? Write in the comments. DALEY: That video had more than 230,000 views and 380 comments in seven weeks. College student Julien Lavandier says he's now hooked on both cigarettes and e-cigarettes. On a typical day, he'll take upwards of 300 puffs of his Juul. LAVANDIER: So my biggest concern is right now, I'm puffing happy, worry-free. And then in 20 years, I'll have to explain to my kids why I've developed popcorn lung or some new form of lung cancer because I didn't know what the risks were of e-cigarettes. It terrifies me. DALEY: He says it took him less than 10 days to get addicted. He's since tried to quit, but now can't go three days without using a Juul. For NPR News, I'm John Daley. MARTIN: This story is part of a partnership with NPR, Colorado Public Radio and Kaiser Health News. Transcript provided by NPR, Copyright NPR.